When you put new things into people’s hands, they’ll find ways to utilize it to do things they never could before. The Puppet Era of Gensokyo brought about radical changes to how its inhabitants handle all sorts of things, from their daily lives to conflict, from the Human Village, to the peaks of Youkai Mountain and the depths of the Underground. Puppets rocked the realm into a new age, a fascinating age where even more possibilities could exist. This story is about four teenagers from the Human Village, who have decided that they want to sneak out of the village one night. Why? 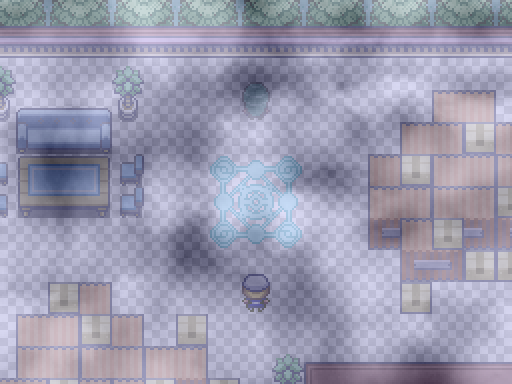 Rumor has it that there is an abandoned mansion, hidden away in the forests. If one listens hard enough, then they can hear what sounds like music coming from it. 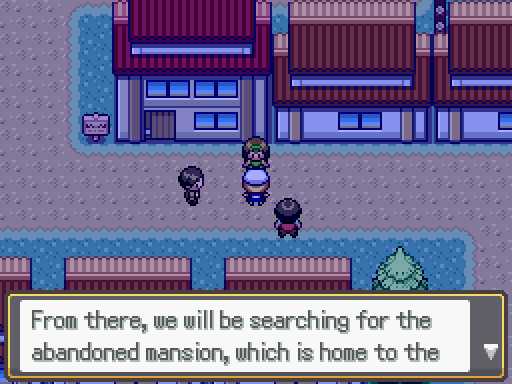 “But if it’s abandoned, then how can it be playing music?” This is what our protagonists hope to find out, as they discover the truth behind The Mansion of Mystery. --Okay now I KNOW what you're thinking. You're probably thinking "Derx, this isn't Faith & Prayer Version! What're you doing!" Except, you probably aren't thinking that because I'm new here, and there's no thread for Faith & Prayer Version here! Well, forget what you don't know about Faith & Prayer Version for now, we're discussing something else! We're talking about a small project I made (and finished! Wowie!) back during October called Touhou Puppet Play ~ The Mansion of Mystery. 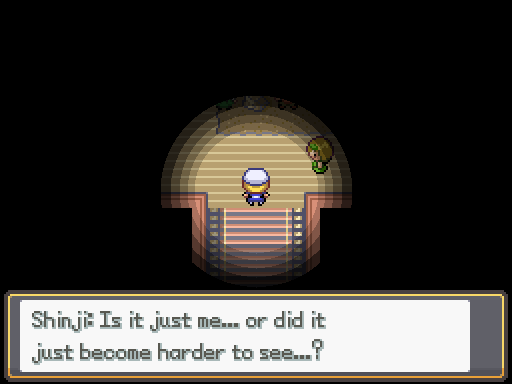 The game was built for the Pokecommunity Game Jam, "Blinded By The Fight" back in October, where you had to follow a specific theme to enter - the theme being utilizing the Dewford Gym darkness circle mechanic. When I saw the theme, I knew instantly what I should make (Though I spent a few days during early development cementing ideas). As such, the game is extremely short - roughly 2 to 4 hours, maybe longer depending on factors. It revolves around a group of four from the human village and their expedition to uncover the truth behind “the mysterious mansion that has music coming from it”. The writing of the game is about as close to your average Touhou plot as I could get, and the way the game is handled is also similar: Six core stages, one Extra stage that gets accessible only if you can Perfect Run (1cc/no blacking out) the entire game. The difficulty is a bit rough, especially if you’re unfamiliar with the 1.8 Type Chart, but it is beatable without grinding, and in one shot. The game also has a slightly modified EXP system, where you get x1.25% exp (5/4ths) for beating a Puppet, just to make up for how short the game is, and how quickly the levels ramp up as a whole. It's balanced around battling every trainer, so take that into consideration! Honestly, making this game was extremely fun! The deadline let me keep myself in check, and I needed fresh blood to work on to try and get me back in the swing of development. I’m glad I made it and took part in the game jam! So far I’ve heard good feedback about it (even one of the judges said it was a close race for first between mine and first place! ), and I know I put in a lot of effort to make the game as good as I possibly could! It is my hope that you all who download and play it can enjoy it just as much, if not more, as I enjoyed making it! Granted I took second out of three, but it was an extremely close second according to the judge. A comprehensive list of credits can be found in the spoiler, because it's very lengthy and detailed. 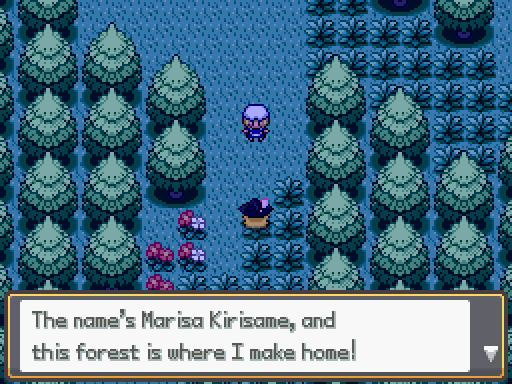 Maruno: Pokemon Essentials. The entirety of the modern build. Wow! The game looks really well done and polished. I love the idea of you expanding on the flash circle thing, and feel like your setting and theme really answers the challenge put forth - a well deserved second place. I like the sprites and think they are well done as well as the maps. They look highly detailed and original. 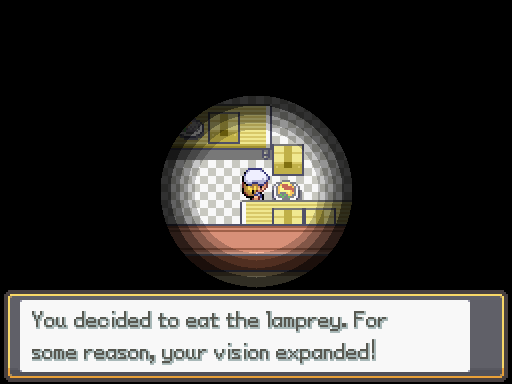 One of the best ROM Hacks I've seen. If you do come back to this game one day and decide to make a sequel/prequel, I can't wait to see how it looks. I really am excited to play this game! It looks amazing! Thanks for the complement! Honestly, I put forth an absolutely immense amount of effort into this, much more than I probably needed to, but when I heard what the theme was I knew exactly what I needed to do. Given the fact that I was suffering from a two year motivation loss after my external fried, I'm honestly surprised I was able to do this- not even do it, but finish it. This is actually the first of any project I've ever finished, so completing it felt exhilarating. 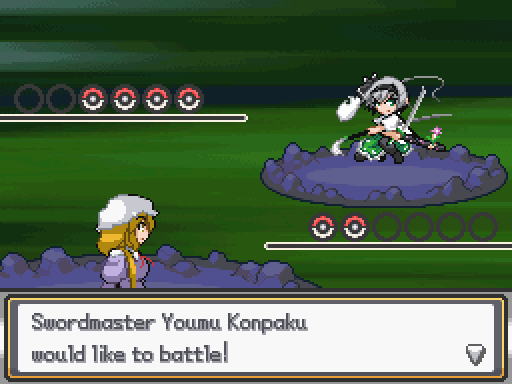 The sprites weren't all mine, but I had permission to use to use every single sprite that was present in the game (and the ones I didn't have strict permission to use were basically anything Hemo made, but the core Touhou Puppet Play stuff is kind of open to use anyway, and that usually includes Hemo's sprites). As for a sequel or prequel, I might recommend checking out Faith & Prayer Version! It's not really a prequel to the game, but this game takes place after the events of Faith & Prayer Version do. 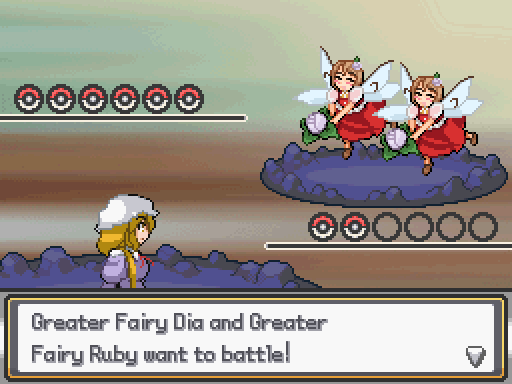 It's also my current main project in the Touhoumon universe, and is in... "active" development. The early game might feel a bit slugish, but I've been working on that for five years, so my methods have evolved along with its development. i'll be sure to check out Faith & Prayer versions when they are completed, until then i'll enjoy this little Touhoumon special, sounds like an impressive project to get off the ground in the span of a week or two. So I might be (read: have been looking into, and dabbling with) making some post full release updates and fixes to the game. Because the game was made in the span of a month, I didn't get a chance to fine-tune absolutely everything (the cutscene in the Ruined Western Mansion F3 is correct for only one protagonist for example), so I wanna go back in and add another level of polish. Looking into a revision of how you get the Good end. I feel it's too punishing right now, and I'm trying to figure out a way that makes it challenging, yet not impossible/forcing you to save before every single battle. 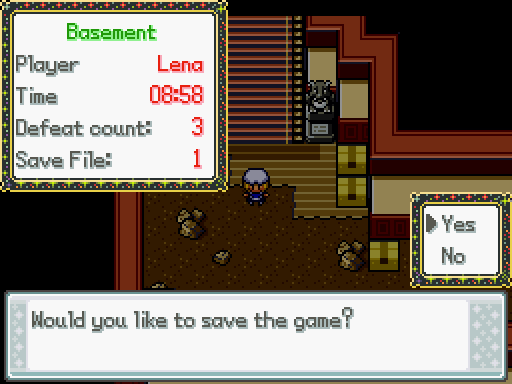 Fixing the cutscene in Ruined Western Mansion (That's gonna be painful, but it's gotta be done). A few text fixes here and there. Removal of a few debug things I left in on accident. I had plans for a "Bonus" boss of sorts, but I scrapped it because I didn't have the time to accumulate the necessary resources. I may look into it now? Folks! It has been far too long since I have been around, and since the bowels of depression have ensnared me within its vicious cycle of self depreciation! While I have not fully escaped its grasp yet, I have managed to create a tunnel that will go upward once more hopefully, and put me back where I desire- making games that make me satisfied. 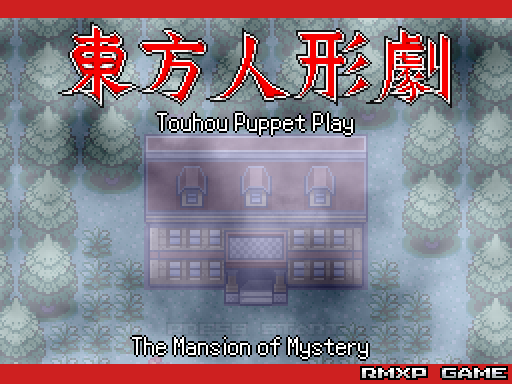 To start with, I have finished up Version 1.1 of Touhou Puppet Play ~ The Mansion of Mystery! It's taken me several months to finish what should have taken me a few weeks, but- it's finished and that's what counts! So what exactly was included or changed in 1.1? Overall, not a whole lot! There were a few things I wanted to fix up from 1.0 that I wasn't satisfied with, add an extra layer of polish, that sort of stuff. However, there was one thing I wanted to include that I didn't get a chance to: the bonus boss. During the 2016 October Game Jam, I had plans to include one final boss in the game, but there just wasn't enough time to throw it in and make sure it all worked. It was a small regret, but one I let sit there until after the game jam subsided. I told myself I'd eventually add it in; and so, with this update, I finally did. The only way you can unlock this fight is by reaching the Extra Stage Mid-Boss, which of course means making it to that point without having the Bad End unlocked. Oh, right! Speaking of the Bad End and Extra Stage, I have some news regarding that! While the loss restriction is still in place, it has been modified to be much more lenient. In 1.01 it was if you lost even once. In 1.1, it's been bumped up to six losses. I felt that this was necessary, and if I could replicate the Touhou Project's continue system better I probably would have attempted to. Alas, it would have been far too clunky, and ultimately not worth the effort. This should hopefully make it much, much more forgiving and allow players to be able to reach the Extra and Phantasm Bonus Stages. Aside from those two big changes, not a whole lot else was changed! Well, I fixed some eye colors, that's fairly big in my book! Maybe not yours, but shrug! At any rate, you didn't come here to hear me ramble! The download link to Version 1.1 can be found below. If you've been waiting to give it a shot, or if you're just now learning about it, or even if you feel like playing another run- whatever the case may be, go for it! Enjoy!